Taking down one wall and building up another was the key to transforming the kitchen and hearth of one Smithon, IL, family home. It started, innocently enough, with plans to take down a wall that isolated the kitchen from the living room: a simple, minor demolition meant to create a larger kitchen with visual access to the living room. 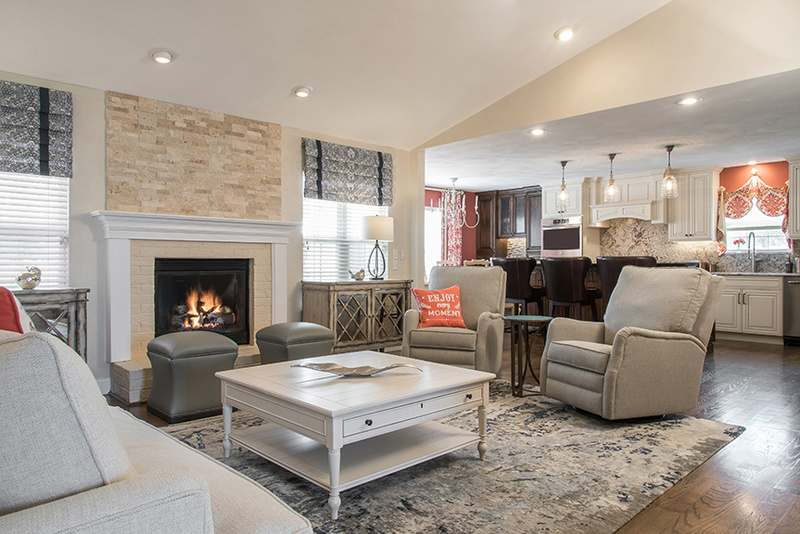 But after Renee Pipher and fiancé Kevin DeRossett initiated the project with the help of interior designer CJ Knapp of Yours by Design, they began to see greater potential in their Smithton, IL, ranch home. Tiles in the kitchen and carpeting in the living room were replaced with hardwood throughout. The couple soon discovered that the demolition of the kitchen wall and the new flooring drove other necessary changes. With the kitchen now open to the living room, the unified space needed to look that way. What Knapp suggested next changed everything more than any of them anticipated. “There was a lot of discussion about where to put the TV because that was on the wall we took out,” says Knapp. “So we built up a half wall by the stairs and put the TV on it. 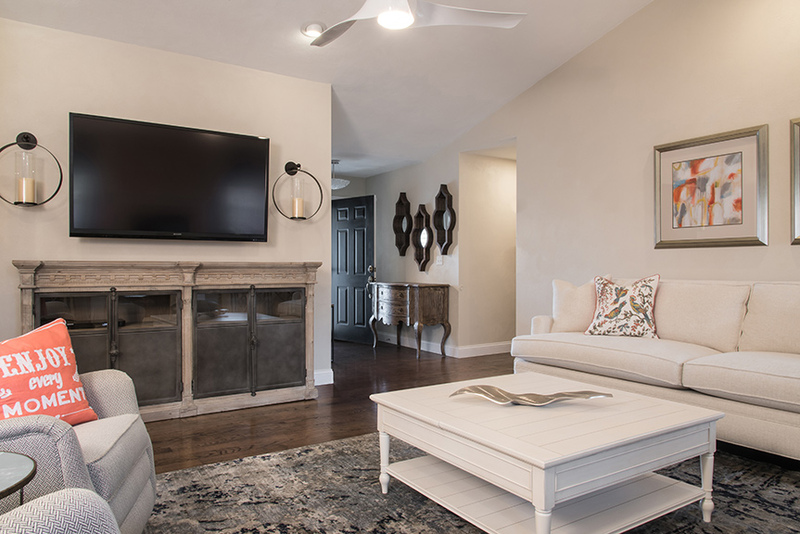 It changed the whole configuration of the room and created a hallway down the stairs.” The new layout made the television visible from all areas of the living room and kitchen, and created more space for a new sofa and swivel recliners. The changes inspired the couple to invest in additional changes to the living room and bedroom. 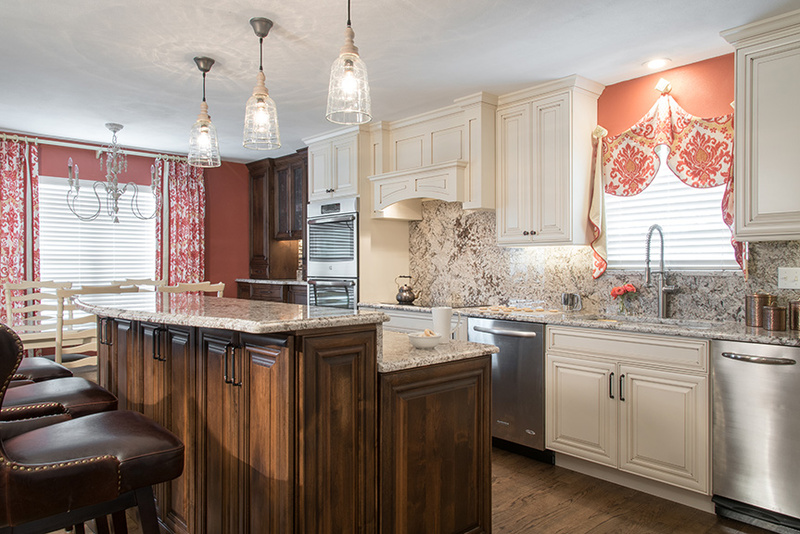 Since the couple wanted a brighter space, Knapp had replaced the dark kitchen cabinets with cream-colored ones and installed a neutral countertop. Walls in both the kitchen and living room went from a dark yellow to a light tan with accents of coral, turquoise and shades of blue and gray. Can lighting and a clustered globe light fixture in the bedroom brought in additional light where needed. And Pipher can see it all without dodging from room to room. The large kitchen island and bar now anchors the open floor plan and provides a great vantage point to view the rest of the house and outside, where her 7-year-old son often plays. “I just absolutely love the fact that I can be in the kitchen while the family is in the living room and they can do their thing. The countertop is sort of like a little bar area where my son can sit and tell me about his day. Everything runs so much smoother. We just use this space so much more,” Renee says.